Quavo and Kanye West have been in the studio together lately. However, much to the intrigue of fans, it's been the Migos member who has been behind the boards and not the other way around. During a recent interview with Los Angeles radio station REAL 92.3, Quavo let the good news slip. "I did a couple beats for Kanye," Quavo revealed. "Me and [DJ] Durel." He then goes on to explain that while he prefers to use Fruity Loops to make beats, 'Ye has opened to his eyes to another realm creatively. "It's crazy," he said. "He got a crazy different feel. He got all his old s—t that he came, that he had coming in making beats…He still uses his original keyboard and he still has old hard drives, old samples, and beats." The pair have collaborated in the past, such as on Yo Gotti's "Castro" and on the epic G.O.O.D. Music posse cut, "Champions." 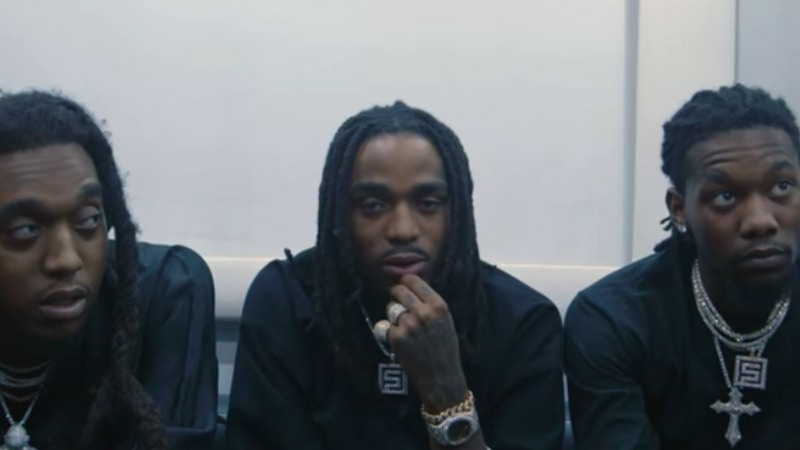 Elsewhere throughout the conversation, Takeoff talks about his love for wrestling and Offset makes a case for the group to be considered one of the best in the game. Their forthcoming album, Culture II, is due out next Friday on Jan. 26. Take a listen to Migos' latest interview, below. Travis Scott on 'Astroworld' and Quavo collab album: "Coming soon"
Quavo drops his first solo project "QUAVO HUNCHO"